So I felt I might as well keep this going for one more strip, well see if there’ll be a third. Probably not. Liking that last panel, got kinda nervous when I was about to sketch it out, because it’s not that normal angel. You know the one. 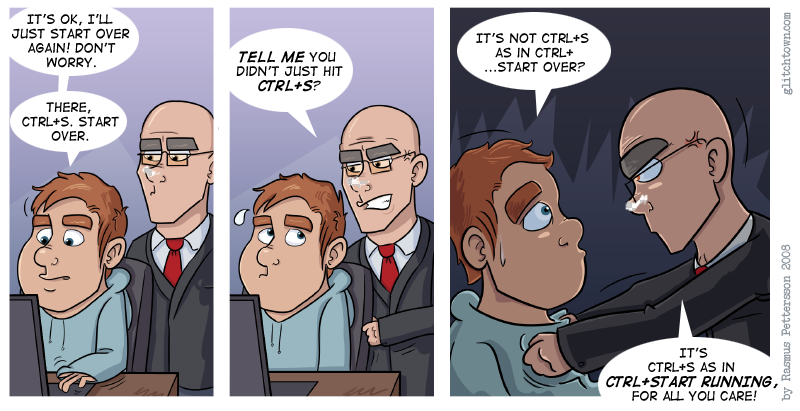 I’m expecting that everyone knows what “ctrl+S” means. That shortcut is really common. This entry was posted on Monday, June 2nd, 2008 at 3:35 pm and is filed under Comic. You can follow any responses to this entry through the RSS 2.0 feed. Both comments and pings are currently closed.